I’ve always thought of chard as a winter food, but that’s not strictly true. Even now, in the sticky heat of July, chard is everywhere at the farmer’s market, all vibrantly colored and adorably bunched. So I decided to play around with chard as a summer vegetable, and stumbled on a couple surprisingly grill-friendly side dishes. With Fourth of July coming around the bend, these would definitely be welcome at any barbecue. First, a salad. I stole this idea from my friend Isabel, who uses mashed avocado and lemon juice as a dressing for thinly sliced kale. I’m not a huge fan of raw kale, but wondered whether something similar might work with chard instead. The answer is a resounding yes: the buttery avocado smooths the bitterness of the raw greens, mellowing them into something soft and juicy and oddly addictive. Add a few flecks of sweet shallot and a little spicy raw garlic, and you’ve got a killer salad. It’s like a fresher, lighter version of the braised collard greens that so often sit alongside good Southern barbecue. In fact, Sam and I agreed that this would be fantastic as a side to a hunk of grilled meat. This is a little more involved than your average salad, because it involves massaging the greens. I’d never done this before, and I’ll grant you, it feels a little odd: you coat the chopped greens with a glug of oil, and then knead them aggressively with your hands until they start to break down and soften. It really is like massaging, in a way–imagine you’re giving someone a deep-tissue shoulder rub, but that someone happens to be a bowl of greens. After a few minutes of kneading, the greens turn slippery and soft, and lose a lot of their initial bitterness. They start to taste like salad greens, juicy and dark and just a touch bitter. It seems like a fussy step, but it really does make the difference between inedible health-food salad and creamy, delicious summer-in-a-bowl salad. 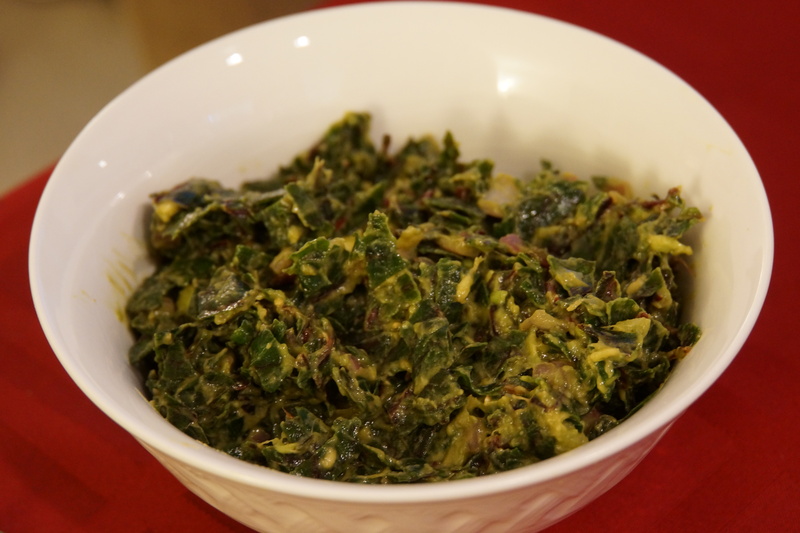 Oh, and if you don’t want to use chard, kale would of course work here–as would collard greens, for that matter. Once the salad was consumed, I had a handful of bright red stems left over. I’m a sucker for using the whole chard, and I’ve been craving pickles something fierce. So the stems got thinly sliced into matchsticks, then tossed with a bunch of similarly-cut scallions. I decided to flavor this batch of pickles with garlic, thyme, tarragon, and bay, so those went into the bottom of a jar. Then I packed the jar with stems and scallions, poured over a simple brine, and popped on a lid. In a couple of hours, I had some seriously addictive fridge pickles. These are a little unusual-tasting, but they’re terrific. The chard stems are fibrous and crisp, like celery, with a faint beetlike sweetness that plays perfectly with the puckery brine. The scallions lose their harshness but keep their quiet oniony essence. The herbs are subtle but pervasive, so that every bite is infused with woodsy flavor. I could easily imagine these scattered over a hot dog or sausage, or even as an accompaniment to a big greasy cheeseburger. The one slight bummer is that the pickles don’t stay pretty for long; over the course of a few days, the chard slowly gives up most of its color to the brine. 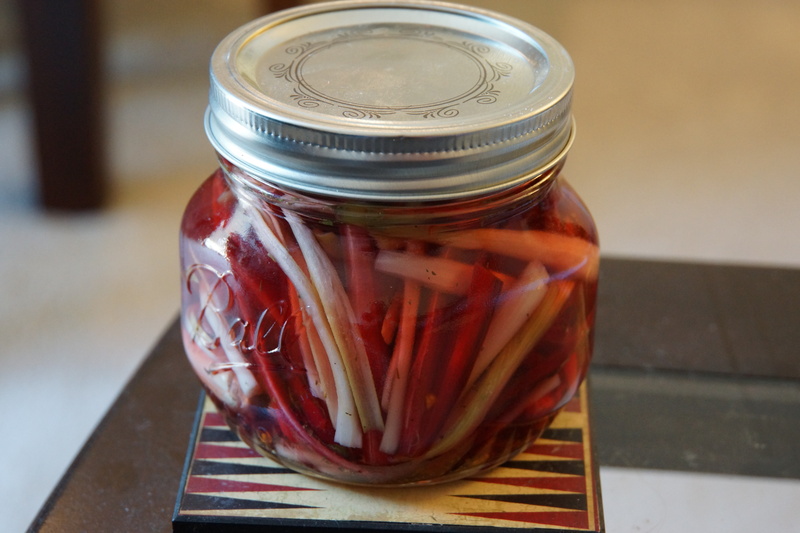 For red chard, that means you’ll end up with pale pink pickles in a red brine. They’ll still taste great, though. In a large mixing bowl, mix together lemon juice, shallot, garlic, salt, and pepper. Set aside to let the flavors meld while you prep the chard. Cut or tear the chard leaves away from the stems and ribs, reserving the stems for another use. Chiffonade the leaves (stack three or four leaf pieces on top of each other, roll the stack into a cigar shape, and slice the roll crosswise into thin ribbons). Squeeze the avocado out of its skin and into the bowl with the lemon juice. Use a whisk to beat the mixture until creamy and almost smooth (a few lumps are fine). Add chard and toss to combine. Taste and adjust the seasoning as needed, and serve immediately. *Different brands of kosher salt yield different volumes. Click here for a handy guide to measuring kosher salt. Don’t use table salt, or any other iodized salt, because the iodine will discolor the pickles. Cut the chard stems and scallions into pieces just long enough to fit upright inside your jar, with about 1/2 inch of space at the top. Cut the chard stems lengthwise into thin batons, and cut the scallions lengthwise into quarters. Combine the chard stems and scallions in a bowl, and toss to combine. Place garlic, peppercorns, thyme, fennel seeds, chili flakes, and bay leaf in the bottom of the jar. Pack the chard stems and scallions upright into the jar on top of the spices; you want them fairly tightly packed, but not so tightly that they get crushed. In a small saucepan, bring vinegar, water, and salt to a simmer, stirring until the salt dissolves. Remove the brine from the heat and pour into the jar, leaving about 1/2 inch of headspace. Tap the jar gently on the counter to dislodge any air bubbles, then cover tightly and let cool to room temperature. Once cooled, transfer the jar to the refrigerator. The pickles will be ready to eat after a couple of hours in the fridge. They’ll be fully pickled after about 2 days, and will last in the fridge for about 2 months.